by Jonas Daugirdas. (updated 24 Dec 2018 with section on diphthongs). PART 1: Pronunciation of consonants d, t, and n.
Many children of Lithuanian families who were raised in America pronounce certain consonants when speaking Lithuanian in a way that makes their spoken Lithuanian quickly identifiable as non-native. One little discussed problem that can cause American Lithuanian to sound markedly different from native Lithuanian is the americanized way that certain consonants are pronounced, especially the letters “d”, “t”, and “n”. What are the differences between how Americans and Lithuanians pronounce these three consonants? 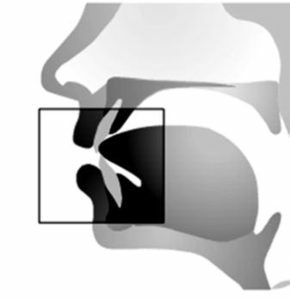 In American English, the consonants are pronounced by the “lingua-alveolar” method. What does this mean? The University of Iowa phonology website shows a comparison of how consonants are pronounced in American English, German, and Spanish. How the consonant “d” is pronounced in American English, in a “lingua-alveolar” fashion. Reproduced with permission from the University of Iowa Phonetics Lab. American — tongue tip pressed against the hard palate. 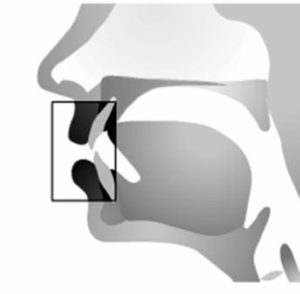 Under the American English section, one can see how the tongue is placed to make an American English “t” or “d” or “n” sound. Basically, for each of these consonants, the tongue comes forward and touches the upper hard palate behind the front teeth, but does not touch the backs of the front teeth. 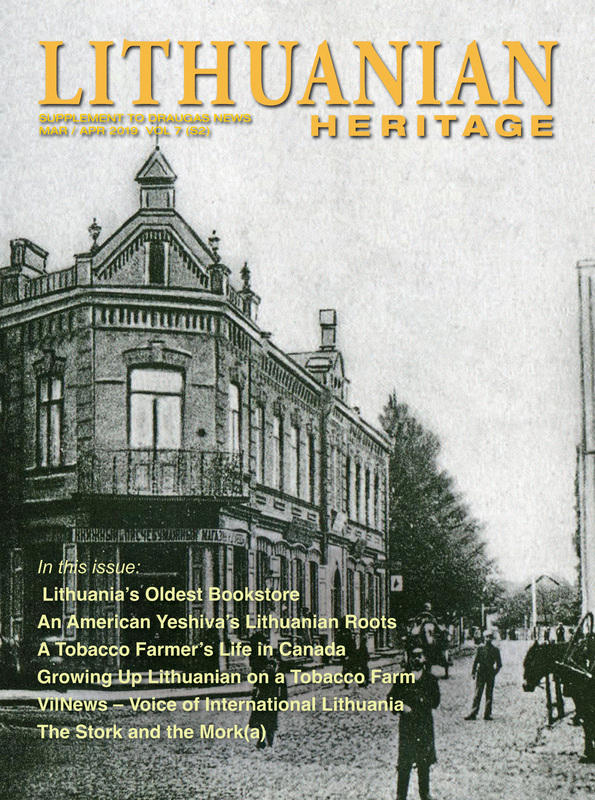 Lithuanian — tongue tip pressed against the back of the front teeth. How the consonant “d” is pronounced in Spanish, which is similar to how it is pronounced in Lithuanian, in a “dental” fashion. Reproduced with permission from the University of Iowa Phonetics Lab. One observation: these animations for Spanish pronunciation show the tongue being pressed against the back of the upper front teeth only; when I pronounce these consonants in Lithuanian, my tongue is pressed against the backs of both the lower and upper front teeth, with the tip of my tongue against the backs of the lower front teeth. LT — say it; EN — spray it. I do believe that in our Lithuanian Saturday schools, where Lithuanian is being taught to American-born children, more attention needs to be paid to pronunciation. Americanized pronunciation of Lithuanian consonants can be easily fixed, but it must first be recognized as correctable. Part 1 has been updated from an article of the same name: Draugas News, 2014 (Jan):1:19. For a compilation of the 6 parts in this series in PDF format as originally printed, click here. 2) University of Iowa Phonology Website (YouTube video): Fonética: Los sonidos de espanol. What about Lithuanian? In Lithuanian, the usage of “fat L” vs. “skinny L” is about 50:50. What determines whether a “fat L” or a “skinny L” should be used? The vowel that follows (marked in bold-underline). If the vowel that follows is an “a,” “o,” or “u,” then one uses a “fat L”. For example: kuolas, kuolo, kuolu. These words all are pronounced using “fat Ls.” Now, if the vowel that follows is “e,” “i,” or “y,” a “skinny L” should be used; for example: balionas, balerina, bailys. What makes this tricky is, that even if there is more than one consonant after the “L”, the choice between fat and skinny L still will depend (in most cases) on the vowel that follows. For examples: valdovas (fat); valdė (skinny); valdyti (skinny); valdžia (skinny). Now that we know how to pronounce some consonants like “n”, “d”, and “t” (see the January issue) and “fat L” vs. “skinny L” (February issue), it’s time to move on to vowels. In this article we begin with the letter “e”. I’m going to give you a simplified version of how “e” is pronounced in Lithuanian, but the rules I’m proposing are far from perfect; they will not cover all instances, and there are exceptions to some of the rules cited below. In Lithuanian, the letter “e” is pronounced in one of 3 ways: (1) like “e” in the word “wet”, (2) like “a” in the word “mad”, and (3) like “a” in the word “baby”. In this article, I’ll refer to these as the “wet e”, the “mad e”, and the “baby e”. RULE 1. An “e” at the end of the word is almost always pronounced as “wet”, whether or not the last syllable is accented. This includes the “e” found at the end of nouns in the locative case. What’s the locative case? It’s the form of a noun that designates place. As an example: “kieme” (in the yard), or “name” (in the house) or “laikotarpyje” (in a given time period). Also, in the common, single- syllable words such as “ne” (meaning “no”) the “e” is pronounced as “wet”. In these examples, by the way, I’m showing the accented syllable of the word in bold-underline. RULE 2. NEVER add an unwritten “y” sound to an “e” unless the letter “i” or “y” actually follows. Some newbie speakers of Lithuanian will try to add a “y” onto the “wet e” sound. This makes the syllable sound like “hey”. Instead of saying “ne”, they say “neigh” or “nay”. This is a no-no. RULE 3. If the “e” falls on the accented syllable of a word, unless the accented syllable is the last syllable, then this “e” (usually but not always) is pronounced as “mad”. For example, in the words: “ledas” (ice), “dega” (burns), “kevalas” (shell), the “e” is pronounced like the “a” in “mad”. However, there are a substantial number of exceptions to Rule 3. Examples of exceptions are: kenčia (suffers), vesti (to wed), krenta (falls), kerta (cuts). In these words the “e” in the accented syllable is pronounced as “wet”. It’s hard to make a solid rule for these exceptions. For example, in the word ridenti (to roll) the “e” is pronounced as “mad”, while in “kenčia” the “e” was “wet”. The most reliable exception is ‘-es‘ which is almost always pronounced as “wet”, even at the accented syllable. For example: mesti (to throw). Other exceptions where the “e” is short (”wet”) despite being in an accented syllable are international words, such as čekis (check) and represija (repression). RULE 4. If the “e” falls on an unaccented syllable of the word, then it almost always is pronounced as “wet”. Pronunciation of “e” in different forms of the same word can change markedly, depending on where the accent falls. For example, in variations of the word “kelti” (to lift): we have keltas (meaning ferry) where the “e” is pronounced as “mad”, and pakelia (he lifts up), where the “e” is pronounced as “wet”. RULE 5 (tailed ę). When a tailed ę is at the beginning or middle of word, it is always pronounced as “mad”, whether the syllable is accented or not. At the end of a word, the tailed “ę” is pronounced between “wet” and “mad”. Tailed ę: What about “e nosinė (ę)” or “tailed e”? In the past, words now written with the letter “ę” were pronounced as “en”, and the pronunciation had a certain nasal quality (”nosinė” means “nasal” in Lithuanian). You can think of the tail as signifying a hidden, missing “n” that is no longer being written as a separate letter. In more recent years the “n” sound and nasal quality are no longer commonly heard in words with “ę”. In present-day Lithuanian, when the letter “ę” is found at the beginning or in the middle of a word, it’s always pronounced as “mad”. For example, in spręsti (to solve) or tęsti (to extend), the “ę” is said as “mad”. When a tailed e (ę) falls at the end of a noun, this signifies that the noun is being used in the sentence as the object of a verb or preposition. Example: Aš puošiu eglutę (I’m decorating the fir tree). Here the terminal “e” would normally be pronounced as “wet”, because the “e” falls on the last syllable of the word (Rule #1), but because there is a tail on the terminal “e”, most speakers will pronounce such an “ę” at the end of a word somewhere between “wet” and “mad”. Another type of word where “ę” is found commonly in the final syllable is the “dalyvis” or participle. Example: Jis sėdėjo nuliūdęs (he was sitting depressed). Here again, the terminal “ę” is pronounced between “wet” and “mad”, but closer to “mad”. RULE 6. the letter “ė”: The letter “ė”is always pronounced in the same way, as a very beautiful, wide “e”. This pronunciation is indicated by writing this letter with an overlying dot: “ė”. There is no perfect English equivalent for “ė”, but the sound is similar to the first syllable of the word “baby”. It’s not a perfect fit, because in English we say “bey – bee”, and the first syllable is a combination of two vowels (the “wide e” sound followed by the “y” sound). For those who know French, the Lithuanian “ė” sound is very similar to the French pronunciation of “é”. A very close fit is how the French pronounce their term for “baby”: “bébé”. Examples of words with “ė” in them are: karvė (cow), sėjo (he sowed). The pronunciation of “ė” is the same, whether the letter falls on an accented or unaccented syllable. So, that’s about it. My wife was telling me: “Jonai, you were good at consonants, but stay away from the vowels. You’re getting in over your head!” Maybe she was (as always) right. Reference: Kazlauskienė A, Rimkutė E, Bielinskienė A. Tartis. Balsiai. Lietuvių kalbos kultūra. Kompiuterinė mokymo priemonė 9-12 klasėms. 2008 UAB Šviesa. This time, we’re moving on to the vowels “-a”, and “-i” and “-y”. 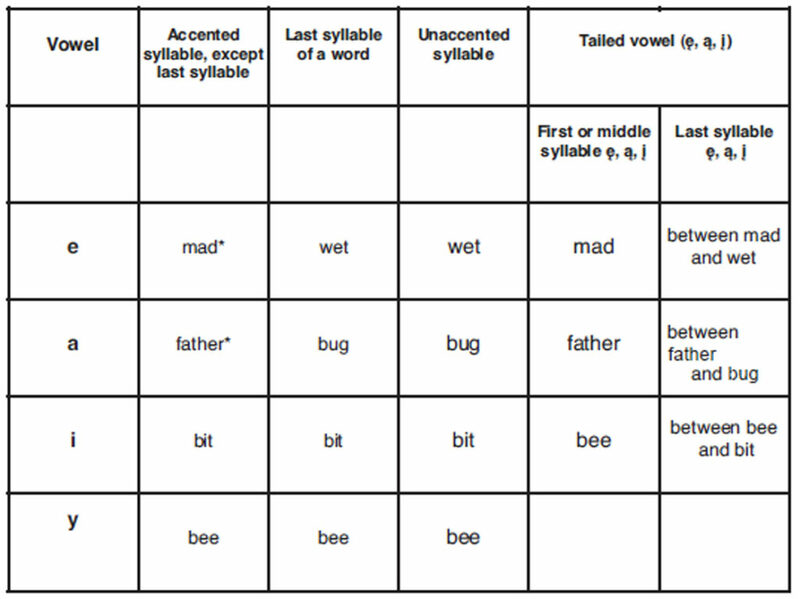 Vowel “-a”: For the vowel “-a” the rules are very similar to those for “-e” (see Table, below). The intense, longer sound is pronounced like the “a” in the word “father”. The short sound is pronounced like “u” in the word “bug”. The longer sound is used when the “-a” falls on an accented syllable, except when the accented syllable is the last syllable of a word. Otherwise, the “bug” form is used. When the “-a” has a tail on it, (“-ą”) and is at the beginning or middle of a word, then it’s pronounced like the “a” in “father”. When the “-ą” is at the end of a word, the pronunciation is somewhere between “father” and “bug”. Vowels “-i”, and “-y”. The vowel “-i” is ALWAYS pronounced as a short sound, like the “i” in the word “bit”. This happens even when the “-i” falls on an accented syllable. The long “i” sound, like “bee”, is used only with “-y” or with the tailed -i, “-į”. Rules for pronouncing the vowels -a, -e, – i, and -y.
Let’s look at a few examples. In these examples, the accented syllable of a word is denoted by bold-underline. And here are a few examples regarding “-i” and “-y”. Accented syllable, other than last syllable: žilas (grey-haired) – (žil-) pronounced as “bit”. So, with “-i” the rule is pretty straightforward. Unless tailed, “-i” is basically ALWAYS pronounced like the short form in the word “bit”. I remember as a student meeting Lithuanians from Argentina and France, who like to say their “-i” vowels like “bee”. “Malonu buvo tave pama-tee-tee” (Malonu buvo tave pamatyti – It was nice seeing you). Sounded kind of funny but cute. **don’t pronounce “o” like “ow”. Just the pure “o” sound by itself! ***when “-ų” falls on an accented last syllable, it is pronounced like booze. Vowel “-o”. This is easy to pronounce in Lithuanian, as it basically is pronounced only one way, like the “-o” in the word bore. Be careful not to pronounce the “-o” like an “ow”, for example, like in the word low. Vowels in Lithuanian are pure and are made up of only one sound. It’s actually difficult to come up with a proper example word in English of how to pronounce “-o” correctly, because many English add the “w” sound to their “o” sounds. In Lithuanian, just the “-o” sound by itself, please. Do not add the “w” sound! Vowel “-u”. The letter “-u” is pronounced like the “-oo” sound in the word book. 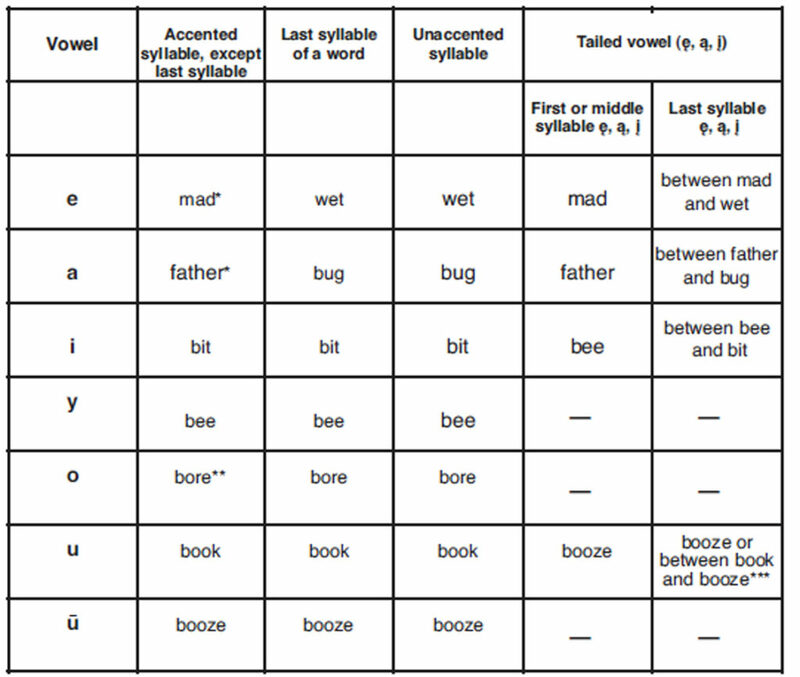 The pronunciation is roughly the same whether the vowel is found in an accented or unaccented syllable, although some will pronounce it between book and booze when the “-u” makes up the accented syllable of a word. Lithuanians who grew up in South America or some European countries sometimes mispronounce the letter “-u” as booze when is should be pronounced as book. The tailed “-ų” can be found in the middle of a word or at the end of a word. The tailed “-ų” is pronounced like booze (or between book and booze) when in the middle of a word. When at the end of a word, the tailed “-ų” is pronounced like booze if the last syllable is accented. If the last syllable is not accented, then the tailed “-ų” is pronounced somewhere between book and booze. Vowel “-ū”. The “-ū” sound is the dedicated long form of the vowel, and is always pronounced like booze. Accented syllable, other than last syllable: voras (spider) – (vo-) pronounced like the bore. Unaccented syllable: mano (my) – (-no) pronounced like bore. Accented syllable, other than last syllable: butas (apartment) – (bu-) pronounced like the book. Unaccented syllable: abudu (both) – (-bu- and -du) are each pronounced like book. Tailed -u (ų), other than last syllable: siųsti (to send) – (sių-) pronounced between book and booze. Tailed -u (ų), last syllable, accented: vaistų (medicines (possessive case)) – (-tų) pronounced like booze. Tailed -u (ų), last syllable, unaccented: vaistažolių (medicinal herbs (possessive case)) – (-lių) pronounced between book and booze. sūris (cheese) – (sū-) pronounced like booze. And here’s your final exam: “Už jūrų marių, už upių vandenėlių” (beyond the ocean seas, beyond the river waters). Please pick up your diplomas on the way out. You are now “habilitated doctors” of Lithuanian vowel pronunciation! Part 6 : “Jonas, do you love me?” or the “Hey you!” ending for Lithuanian names. You’ve been dating for three months now; you like her and she likes you. With deep, soulful eyes, she looks up at you and asks, “Jonas, do you love me?” How do you reply? “No,” of course. Why? All your life, no one has ever addressed you as Jonas; rather, your parents, relatives, and siblings always call you Jonai. 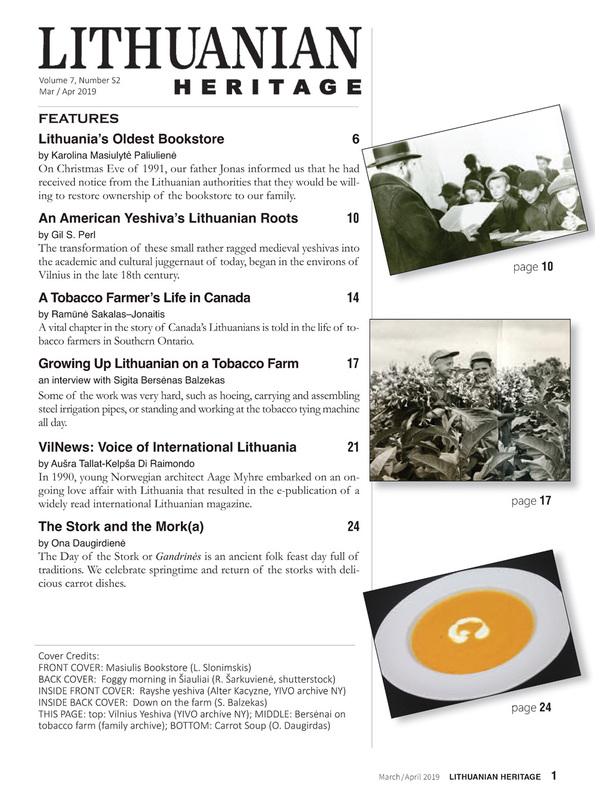 For children who don’t speak Lithuanian, the “Hey you!” case still has an impact when addressing one’s father or grandfather. The word for father is tėvelis, and for grandfather is senelis. If your child goes up to his or her Lithuanian father or grandfather and proudly announces, “Tėvelis, tėvelis, or senelis, senelis, look what I made!”, it might make tėvelis or senelis feel even more proud if the kid were to say, “Tėveli, tėveli, or seneli, seneli, look what I made!” Note that the “Hey, you!” ending for tėvelis or senelis is -i, the same as for people names ending with “-is”. Lithuanian is a tough language, and the “Hey, you!” form can be different for nouns other than names. In some instances, nouns ending in -as get changed to -e (konsulas, konsule), and nouns ending in -is may get changed to -ie (šunis, šunie), but that’s a topic for another day. For a PDF of parts 1 through 6: click here. What is a diphthong? “A sound formed by the combination of two vowels in a single syllable, in which the sound begins as one vowel and moves toward another (as in coin, loud, and side ).” So, that’s clear enough. In Lithuanian, as in any language, there are a number of these. Sometimes the way a given diphthong is pronounced depends on the region of the country. One nice thing about diphthong pronunciation is, that it doesn’t depend on the accented syllable as much as regular vowels, although for some diphthongs, the accented syllable can play a minor role in how they are pronounced. Note: Some of the vowel combinations discussed below are not true diphthongs in the strict sense. How to pronounce diphthongs and vowel combinations that begin with the letters “a” or “e”. The diphthong “au” can be pronounced as either “loud” or as “out”. The first has more of an “a” sound, and the second, more of an “o” sound. Either is correct. If you use the “out” pronunciation, people might thing you’re from the Kaunas region. Maybe best to stay in between these two variations. So, you can practice with the words: pauk-štis (bird), more like “out”; or mau-dy-tis (to swim), more like “loud”. The usual way to pronounce “ai” is like “rice”. If the “ai” falls on the accented part of a word, some Lithuanians will pronounce it more like “ride”, with a bit more emphasis on the initial “a” sound. You can practice with the words “baig-ta” (finished), “lais-vė” (freedom), and “pa-baig-ė” (finished). The “ride” pronunciation might be heard with words such as “lai-mė” (luck), or “kai-mas” (hamlet). How to pronounce “ei”: “late” or, for some words, blend the “a-” with the “-ie” sounds in “laddie.”. For most, but not all, words, the diphthong “ei” is pronounced the same way as the long “a” in English, for example, like in word “late”. For one particular group of words, the pronunciation of “ei” is substantially different. These words include the verb “leis-ti” (to let), “keik-ti” (to curse), “meis-tras” (master craftsman), and I’m sure there are others. In these cases, the “ei” is pronounced in a way that has no really good English equivalent. 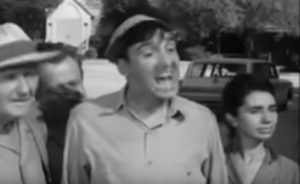 It’s a blend of the “a-” and “-ie” sounds in the word “laddie.” Another example: think of how Gomer Pyle on the “Andy Griffith Show” pronounces “say” in “That’s what I’m saying,” (sei-yin). How to pronounce vowel combinations that begin with the letter “i”. The dipthong “ie” is a very commonly used in Lithuanian. It is pronounced mostly as “yet” but there is a bit more “I” in the sound. So, if you take 2 parts “yet” and 1 part “year”, and add the mixture after the consonant, you’ll be very close. How to pronounce “ia”: “y” before “a” with the latter pronounced either as “father” or “bug”. The “y” sound is very short, and almost disappears, softening the consonant before it. So, the word “čia” (here) is NOT pronounced like chee-ya. Practice the words: “čia” (here) “ulia-vo-ti” (chill out, spend time relaxing). Keep shortening the initial “y” sound until there is almost no “y” sound remaining. The “a” by the way,in these two words is pronounced like “bug”. Think: “kiau-lė” (pig), “spiau-dy-ti” (to spit). Here, with regard to the terminal “au” of this “tripthong”, it can be pronounced either like “loud” or “out,” as per the above. This one’s easy. Just like it sounds. Again, easy, just remember, that the “y” in front of the “u” (the latter pronounced between “book” and “booze”) is very short; so short, in fact, that it should almost disappear! Also, consider: “niū-rus” (somber). In this case, it’s a long “ū” making up the second vowel of the diphthong, so here it is pronounced like “booze” with a short ‘y’ in front of it. “pjūk-las” (saw). And then it’s pronounced in exactly the same way. How to pronounce vowel combinations that begin with the letter “o”. This is the only vowel combination of note beginning with the letter “o”, and pronunciation is straightforward, similar to “boy” in English. In the word “koj-i-nė”, the “j” sound is pronounced like “y” and then the following “i” sort of extends it. The “koji” part is pronounced similar to “boy” and the extra “i” gives a slight emphasis to the “i” sound, but pronounced together, as a diphthong. How to pronounce vowel combinations that begin with the letter “u”. This combo is a true diphthong. In the English word “Louie”, the terminal “ee” sound is more prominent than in the Lithuanian “ui”, and the initial “oo”sound is also less prominent in Lithuanian, so it is not an exact match. I have not been able to think of a pure English equivalent, but if you say “Louie” quickly, blending the initial “oo” sound and the terminal “ee” sound, keeping both sounds short, you will come close to the Lithuanian “ui”.